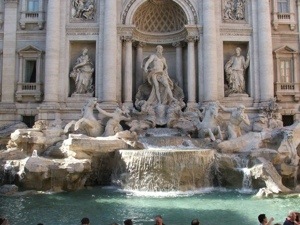 Have you ever tossed a coin or two into a fountain and made a wish? Did it come true? 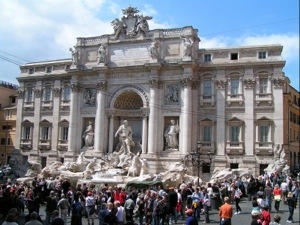 When my sister and I were on our backpacking trip through Europe, we spent at least four days visiting Rome with our three Australian travel companions and we made the point of going to the Trevi fountain to throw a coin and make wishes. I copied and pasted this blurb to make sure that anyone who reads this and hasn’t visited the Trevi fountain yet, if they do, that they will do it correctly so that their wish does come true because I know that I did it all wrong. I did not throw my coin with my right hand over my left shoulder, that’s why my wish didn’t come true and why I haven’t returned to Rome as of yet. Seriously, I am sure that the superstition isn’t true but just in case, keep it in mind if you ever get there, on the off chance that it is true. I do remember how majestic the fountain is, how clear the water was that you could see all of the different coins from all around the world. I wonder how many Euros there are in relation to the other currencies nowadays, back then when I was there the Euro didn’t exist, there were instead Lira’s, French Francs, German Marks, Dutch Guilders and maybe even some Greek Drachmas. I remember that the Spanish Steps weren’t far off and the largest McDonald’s that I had ever seen was right there next to the steps. I have to say that my memories of Rome are still fairly clear and vibrant, I couldn’t stop looking everywhere, all around, left and right, up and down, there was always something breathtakingly beautiful to see. I had really loved Rome and I would love to get back there one day, just to walk all throughout the city, it is such a magnificent city with a tremendous amount of history that four short days is not long enough to fully appreciate all of its riches. I wish that I had known of the coin tossing instructions back then, I would have returned to Rome much sooner.